Like every instrument instructor, I've seen my share of botched holds by students. It is my belief that many such errors are caused by poor visualization of the hold and its entry (rather than physical inability to hold altitudes or headings and such), and that a systematic approach to visualization can be very helpful in forming the right mental picture consistently. I developed my hold visualization technique (which I call the "The Dirty Dozen" method, despite that it has only seven steps) and have found that it has significantly helped my students in flying their holds, and a number of instructors have picked up this and are having good success with it too. I will also admit this: I use this same technique when I fly holds personally under IFR and when I have to think faster than the student in assigning him/her practice holds. You are welcome to download, print, and post the .PDF document below explaining the steps involved at your FBO, Flying Club, or wherever you wish. Just please don't alter the document or obscure its copyright notice(s). I hope it will help you improve your holds. If you don't like my particular method, I still suggest that you use a systematic visualization techique. Just one note: the last step simply states "the entry is.." You may be a bit suprised by this lack of direction. 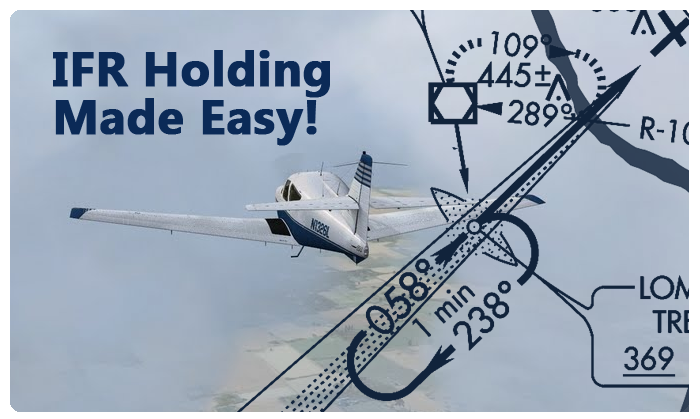 For your IFR checkride, you will need to know the correct entry procedure for a given hold. However, as a matter of course, the correct entry procedure is pretty much always the one where you need to turn least at the holding fix to smoothly enter the racetrack pattern. This method does not specify a hard and fast rule for choosing the entry, but relies on your visualization of the entire picture and your overall knowledge of entries to help you decide on an appropriate and legal entry. This card is made available free of charge for your convenience. We hope that in return you will consider our products in the future and/or tell others about them, especially our GroundSchool series of test prep software and our Safelog pilot logbook. However, please understand that use of this PDF is at your own risk and no guarantee of any kind of its suitability for any operation is provided.